Young people are constantly risking their hearing, and many of them don’t even realize it. For many young people today, being surrounded by noise is just a fact of life. Cities are loud places to grow up, and schools and universities are full scenarios that expose young people to dangerously loud volume levels. Many teens and young people use their personal listening devices to drown out these background noises, and often turn up the volume far too loud or listen for way too many hours, risking their hearing health as they listen to music, play their video games, watch movies, or chat with friends. The World Health Organization (WHO) estimates that up to half of young people between the ages of 12 and 35 are risking their hearing health. That’s nearly 1.1 billion people! They risk noise induced hearing loss, or hearing loss due to exposure to loud music for far too long, whether at school, at work, at the gym, or from unsafe listening practices. Do you have any young adults in your family? Do they spend hours of every day plugged in, listening with earbuds without taking a break? They often don’t realize that listening to their music at these volumes can have such a negative impact on their hearing health, or that they could be permanently damaging their hearing. 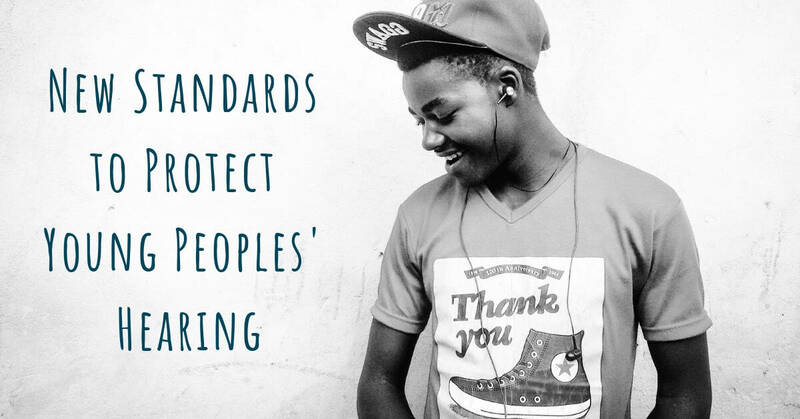 The WHO, in collaboration with the International Telecommunication Union (ITU), recently released new standards to protect young peoples’ hearing. Through both education and technology, they hope to regulate the use of personal listening devices, such as smartphones and other audio players, so that they’ll be safer for young people. The guidelines are available online, and this toolkit for safe listening devices and systems will help you protect your hearing, and the hearing of the young people in your life. The new standards for safe listening practices are focused on the use of personal listening devices. While it’s true that our young people need to be aware of the dangers of loud noise at concerts or sports events, the new guidelines target the use of earbuds and headphones. They are urging manufacturers to do more to protect young people’s hearing through the use of programs and features that could monitor listening practices. For example, a “sound allowance” function would give the phone permission to monitor length of listening as well as volume, and notify users when they’re nearing their limit for the day. Users can then change their listening behaviors to safeguard their hearing. Manufacturers could also develop personalized listening profiles, that would track listening practices, give suggestions for safer listening, and notify users when it’s time to take a break or turn down the volume. Finally, the WHO suggests adding more volume controls, restricting the maximum volume, or even adding automatic volume reduction that would lower the volume when levels become unsafe. Parental volume controls are also becoming more common, and allow parents to monitor their child or teen’s listening habits. The WHO’s “Make Listening Safe” initiative will improve hearing health around the world, and My Hearing Centers wants to do our part to help young people protect their hearing. If the young adult in your family is struggling to hear, or has unsafe listening practices, call us today at My Hearing Centers to book an appointment. We’ll test their hearing, and help them take care of their hearing health for now and for the future.